The mister and I recently spent 6 days in Southern Italy, out of which four days were at the Amalfi Coast and two days in Naples. We used Naples as a base, you can use Rome too as both cities are well connected to the coast. Below is a day wise itinerary, including where we stayed and ate, and an indication of the budget. 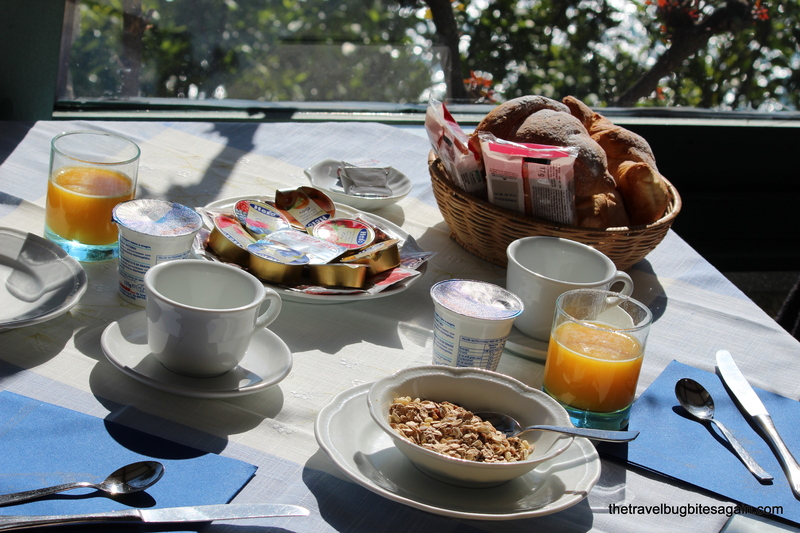 Food, food and more food – you probably know by now that food is a very important part of travelling for me. And even if it’s not the same for you, Italy is one place that WILL convert you. 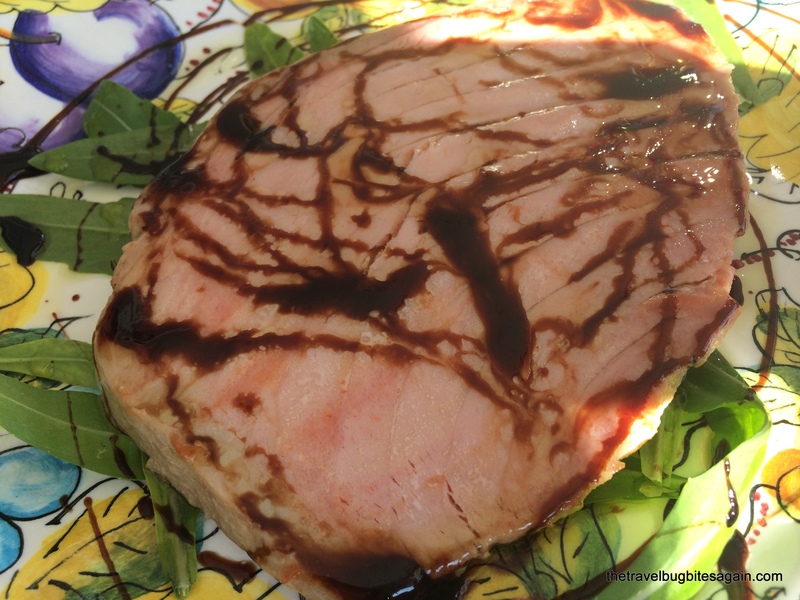 The quality of food is pretty high, no matter where you eat and the variety is immense. 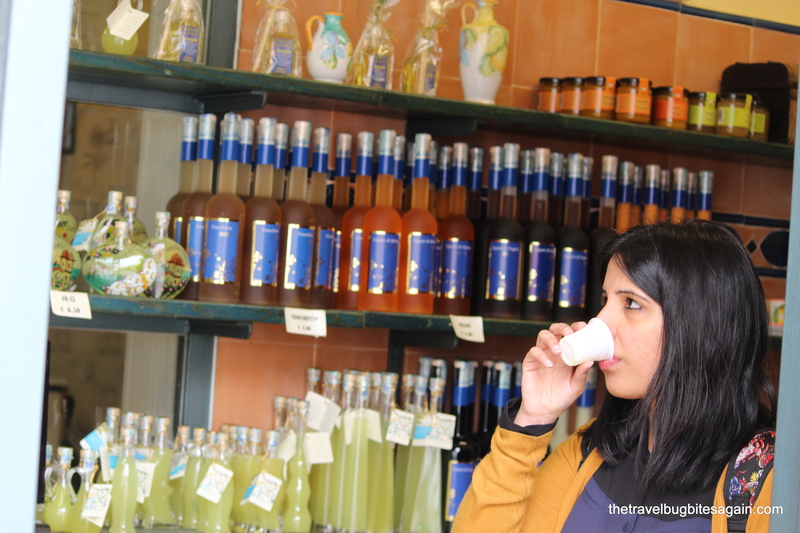 A trip to Southern Italy is incomplete without trying Limocello – traditionally had as an after dinner digestive liquor, I loved it as a cocktail with loads of ice. Another favorite was the Limoncello sorbet which tastes wonderful on a sunny day. The Path of God’s trek offers spectacular views of the coast (plus it’s a good workout after all the eating). Strongly recommended. We flew Transavia airlines from Amsterdam to Naples and headed for the information desk to understand how to reach the Amalfi coast. The lady at the counter was extremely helpful so figuring this part was no problem. We were told that we needed to take a bus from the airport to Sorrento town, then change a bus to go till Amalfi town (yes, there is a town on the coast called Amalfi), and from there a third bus to go to our hotel. She told us again and again that “it won’t be easy to get to Amalfi” and I wondered why. 3 buses and 4 hours later (just to cover a 70 km stretch), I knew what she meant. So brace yourself if you want to reach the coast using public transport, it needs patience and time. You can also hire a private car which is more convenient. If you are four people to share the car, the cost is nearly equal to what you spend on the bus. But the bus is fun! In summers, you have the option of ferries as well. We reached our hotel around 3 pm, while the address stated Ravello, the property was about 5 kms from the main town of Ravello, I am not sure if this was intentional or if that area is officially listed under Ravello district. Anyway, I didn’t really care because the property was beautiful. It is a private villa now converted to a B&B, called Villa San Michele. Family owned (as most B&Bs and many restaurants on the coast are), the hotel is simple, very clean, with views that will blow your mind. The bathroom has glass windows looking onto the sea, a little something for your morning rituals. Check in was simple, and though I was dying to have a bath, we were really hungry and thought we should get something to eat first since most restaurants close around 3:30 pm. Our property had a restaurant as well but it only opens during summer months, hence we decided to walk to the closest town Atrani, which is 5 min on foot. Atrani is everything that you will imagine Amalfi coast not to be – it is simple, understated and very rustic. At 4 pm, all restaurants in the town square were closed, but the owners (all families) were hanging around in groups, chatting loudly, laughing. Kids were goofing around, people and their dogs were out and about. It was a town, but it had the feeling of an old neighborhood, one where everyone knows each other, where meeting every day is a way of life, and simple pleasures matter most. We eventually found one place Ristorante IL Veliero which was willing to serve us lunch, and it was the worst meal of this trip. 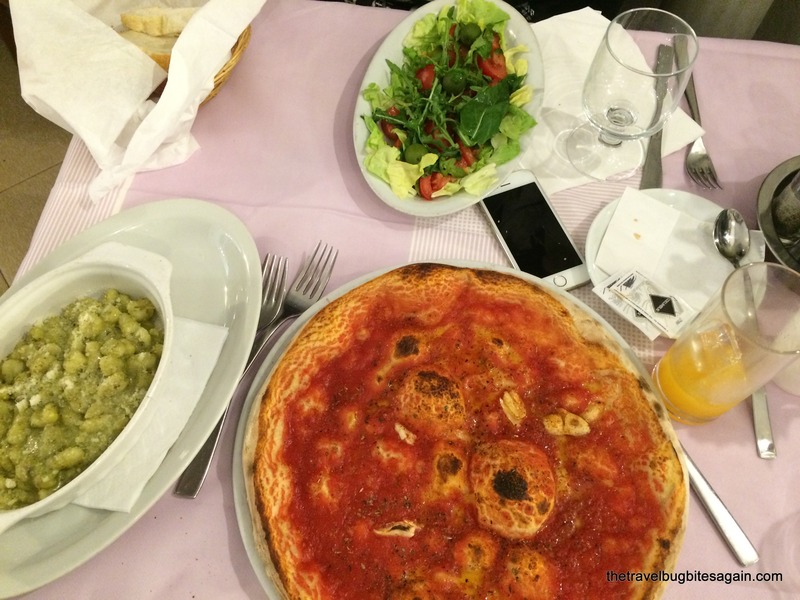 The food was so disappointing, and we were almost heartbroken that our first Italian meal was such a disaster. But since I had exceptional food everywhere else I went in the days to follow, I will gladly let this one go. I guess it was the odd timing. That and the fact that the owner wanted to make some money even though they were not prepared, as he knew we won’t get an option anyplace else. Post lunch, we wandered around the lanes of Atrani, and it was beautiful. Most people smile if your eyes meet, wonderful isn’t it? Budget – Villa San Michele cost us €100 per night for two people (prices as of March 2016). Inclusive of breakfast. There is a general store close to the hotel, and we decided to buy a bottle of local wine and enjoy it in our balcony before heading out. 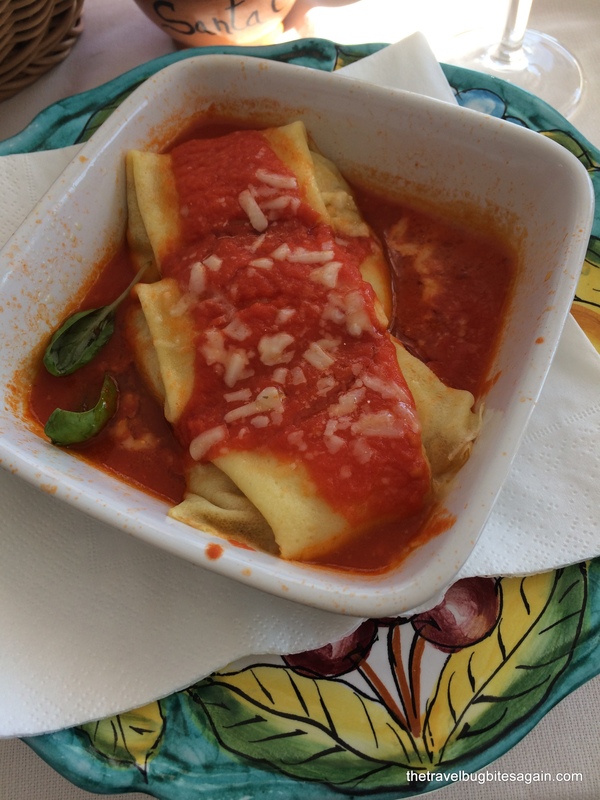 We were really keen to eat at an authentic restaurant after the disappointing lunch, and our villa owner recommended we try out the local favorite A Paranza in Atrani. I cannot say enough good things about this place, the food is exceptional (a tad expensive though) and if you love seafood, this is heaven! The staff is very friendly and will gladly help you in making a decision on what to order – we tried Bruschetta, Steamed fish stuffed with broccoli, Ravioli and Grilled fish with vegetables. The fish is so fresh you can literally taste the water in it. Strongly recommend eating here at least once! A fiasco over my morning tea and I was totally surly, but then I had the best orange juice I have ever had, at breakfast, and that helped :-D. Honestly, the orange juice in Amalfi is something else, the taste, the smell is beautiful. 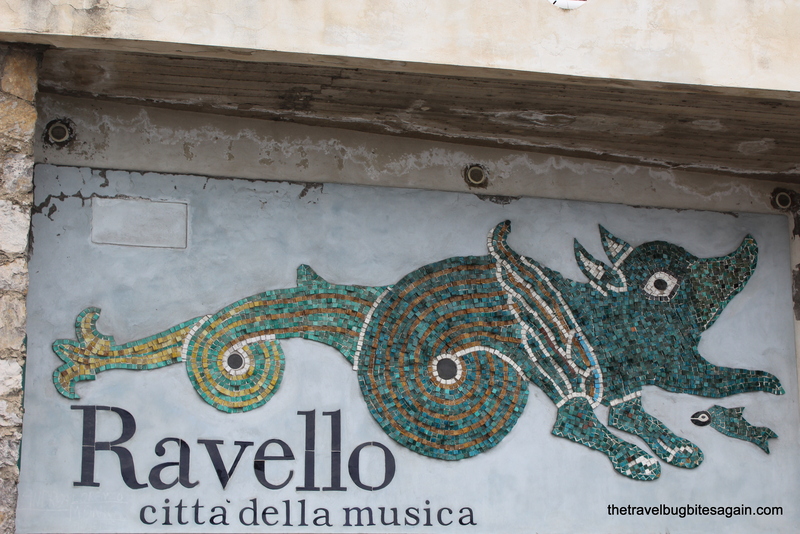 We decided to visit Ravello which is a hill town high above Amalfi (it is 5 km away so about 25 minutes on the SITA bus). It is a very small town, and so so beautiful, I really wished that we had stayed there as well. 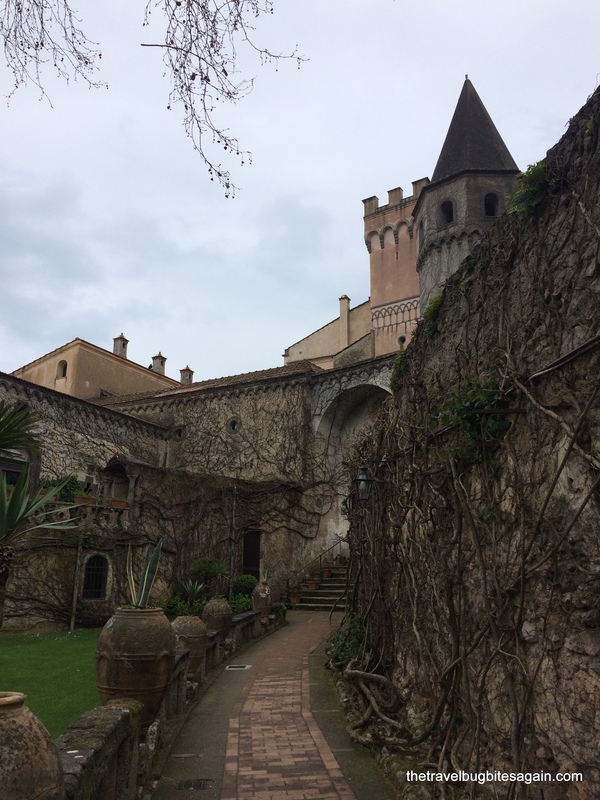 We spent a couple of hours exploring narrow streets, petting fluffy cats, checking out a Limocello factory and beautiful Italian pottery. 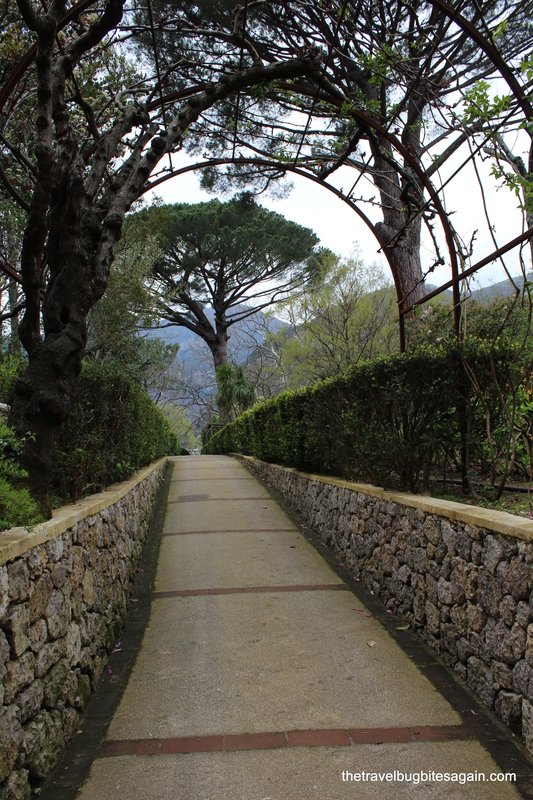 Ravello is well known for the Wagner festival, an annual festival of music and arts which is held in the summers. 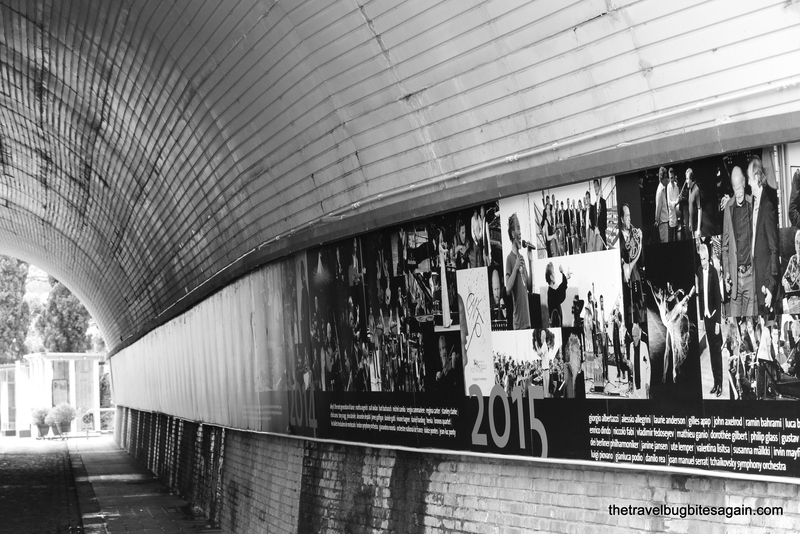 You can see traces of this as you enter the town square through a tunnel, which has pictures and memorabilia on the same. I would totally recommend spending a night in this town. 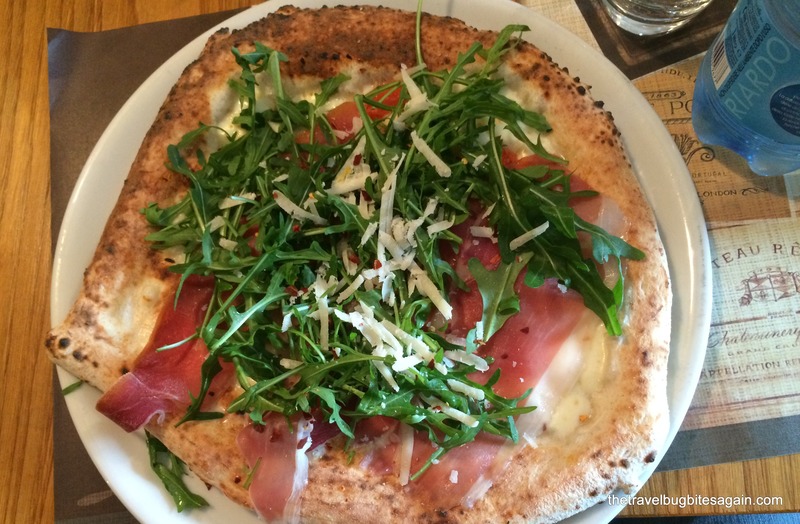 We tried out Mimi’s pizzeria, since we had read some great reviews online. The café is cozy and friendly, and was very busy during our visit. I tried “Limoncello & friends” which is an icy minty gin drink. 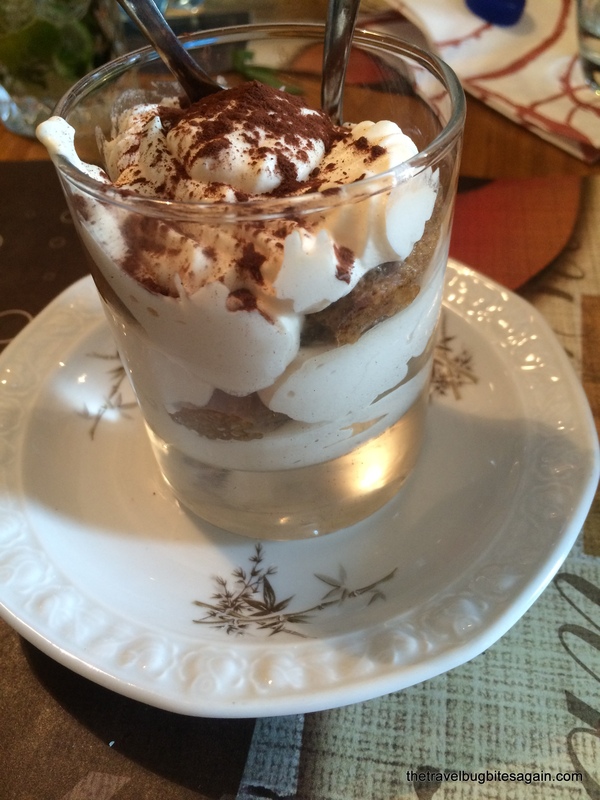 We ordered a pizza with rocket along with Lasagna Pomodoro and finished with Tiramisu. Their bread is the best I have had. 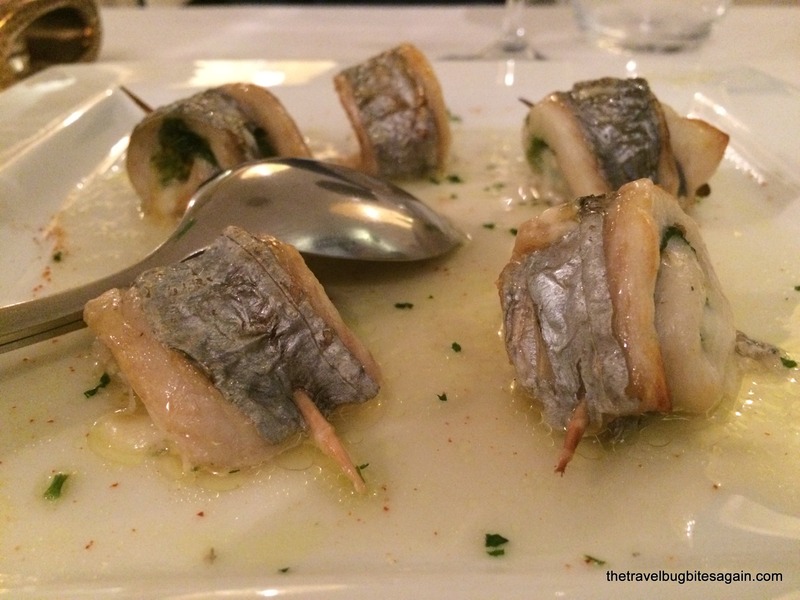 Italy totally lives up to its foodie reputation. Our stomachs more than full, we decided to walk around a bit more, and came across Villa Cimbrone, a five star property which is an extremely popular spot for weddings and honeymoons, the gardens and terraces are open to the public and offer the most spectacular views of Amalfi. There is a ticket for entry (euro 7 per person) which made me reconsider my decision as it screamed tourist trap. But it wasn’t! The weather wasn’t the best, but if it is a sunny day, you can easily spend a few hours walking around the property. It is extremely well maintained, with beautiful gardens and panoramic views of the coast. Definitely recommend a visit! We decided to head back around 5 pm, and take the stairs leading from Ravello to Atrani to burn all the food we were eating (and ready ourselves for the next meal 😉 ). It is fairly easy to locate these stairs – if you don’t have GPS, ask anyone around. As easy as I thought these would be as they are “downhill”, it wasn’t so because the steps change width and height all the time and it is a mountain, so expect a bit of strain on your ankle. 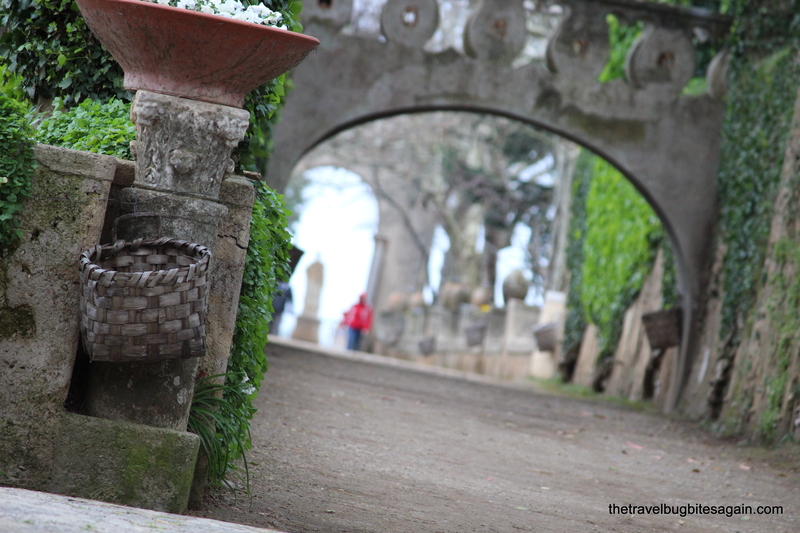 But what you get in return is unending lemon groves, cute little houses and friendly locals who will greet you with a happy “Ciao”. 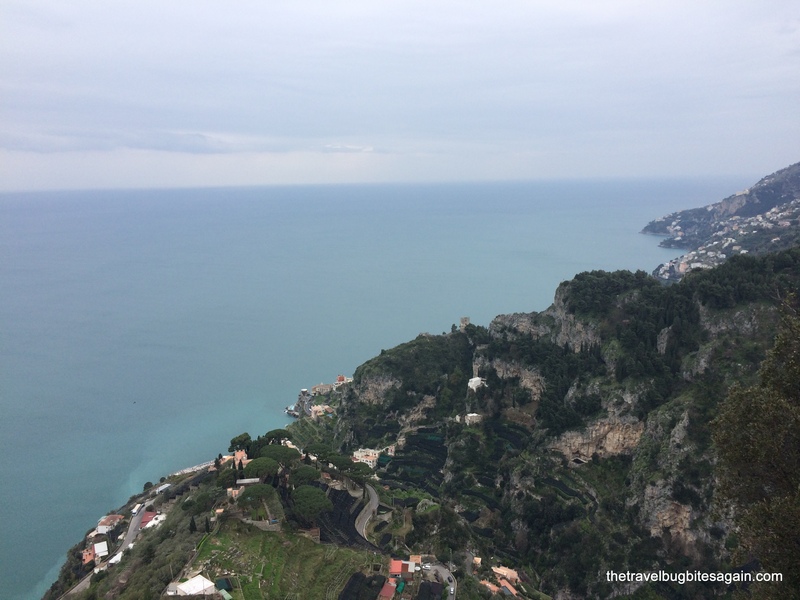 We decided to explore Amalfi town, which was about 2 kms away from our villa(a 5 min bus ride or a 20 min walk), and it was another world altogether. Bigger, more touristy and busy but beautiful nevertheless, you can easy spend a few idle hours roaming the streets, checking out the cathedral and shops selling hand rolled pastas, Limoncello goodies. A few “happy hours” later, we decided to check out as many restaurants as we could (from the outside) and finally agreed upon (another family run) IL Teatro. The staff was so warm, they chatted with us and wanted to know where we were from, were very involved in our order and experience. And it seemed very natural, not really like they were doing it because we were tourists, I guess that’s Southern Italy for you. 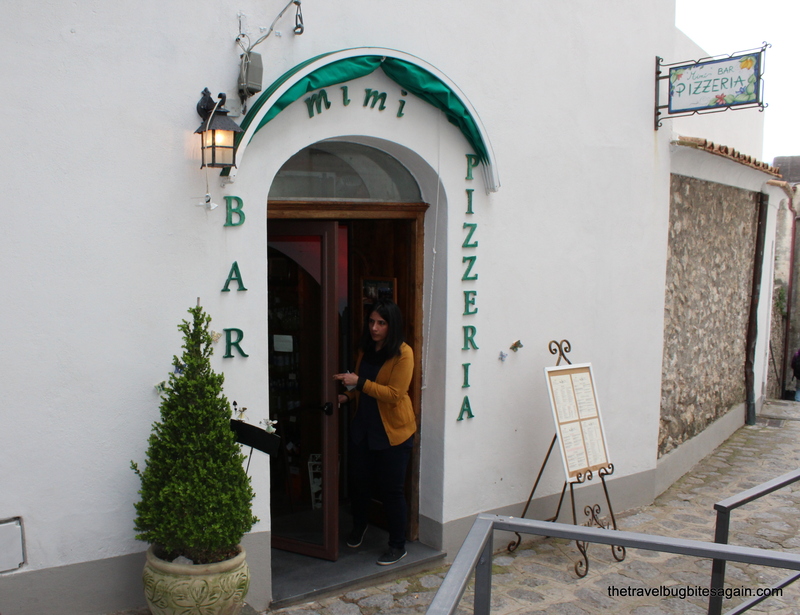 I had the best non-cheese pizza in Italy here (full of garlic, oregano and olive oil). Worth a stop. We checked out and started towards our next stop which was the tiny village of Nocelle. 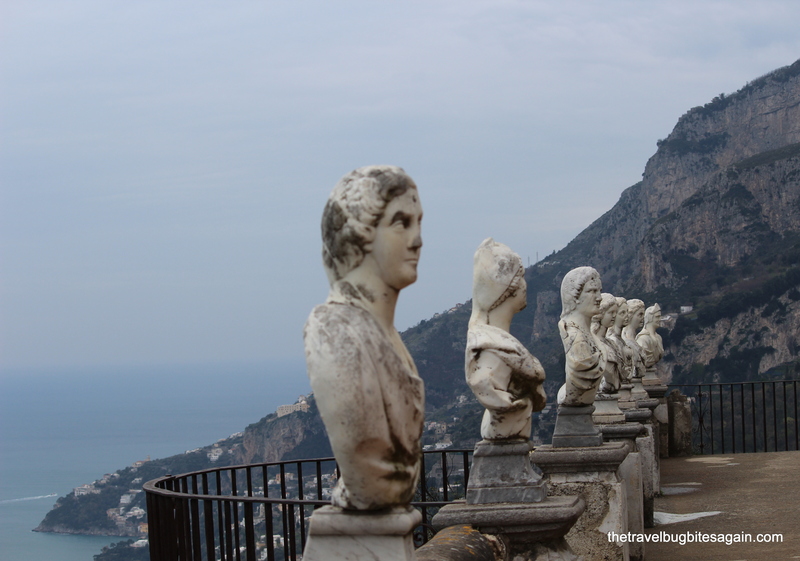 To reach here, we took the bus from Amalfi town to Positano, and then a local bus from Positano to Nocelle. One important tip on the buses – while you may see a schedule posted at most bus stops, I wouldn’t recommend banking on it. Buses in Amalfi have a mind of their own, the best way to use them is to always verify at the closest shop on when the next one will come. It happened to us more than once that the schedule showed the next bus in thirty minutes but it actually came in five. At the bigger towns, you will find a lot of buses and tourists so its’ not really a problem to figure out. But never (and I MEAN IT), make the mistake of planning a flight or a connection without a couple of hours of buffer, you may live to regret it. Nocelle is a very small village, just a handful of houses, one local store and one restaurant. 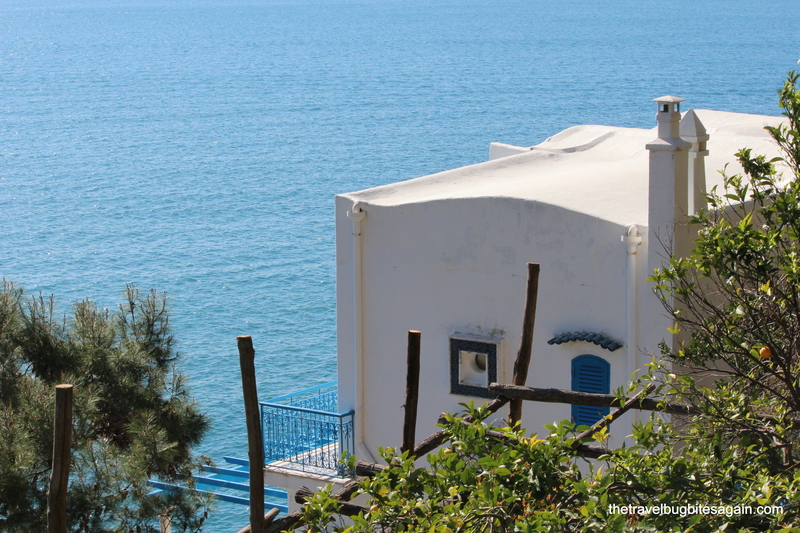 It is a quaint, sleepy village, unaffected by the glitz of Positano, even though they are close neighbors. It can accommodate a handful of tourists, and it seems more than happy to keep it that way. We stayed at the Casa Cuccuro B&B, run by Dina and Peppe, which is a beautiful hill house, and the owners take great pride in it. There were five families staying while we were there, but the house is big enough that you don’t feel like you are getting in each other’s way. There isn’t much to do in the village, as we learnt but it is a great experience if you like peace and quiet, and can enjoy something a bit offbeat. Budget – Casa Cuccoro cost us €80 per night for 2 people. Breakfast in included. 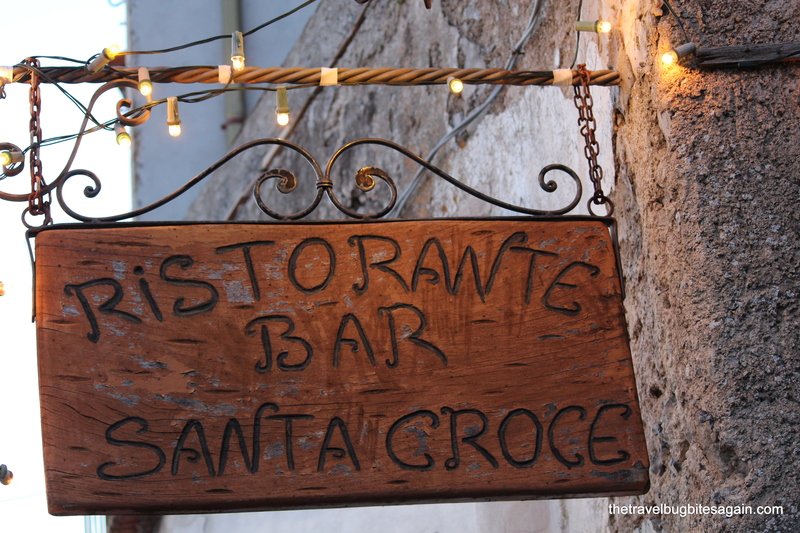 Santa Croce is the only restaurant in the village, and we had a lot of meals here (three to be precise). The menu is limited which means that we pretty much tried everything that was on it. If you want to venture out, there are a couple of restaurants in the next closest village Monterpurso which is 2km away. 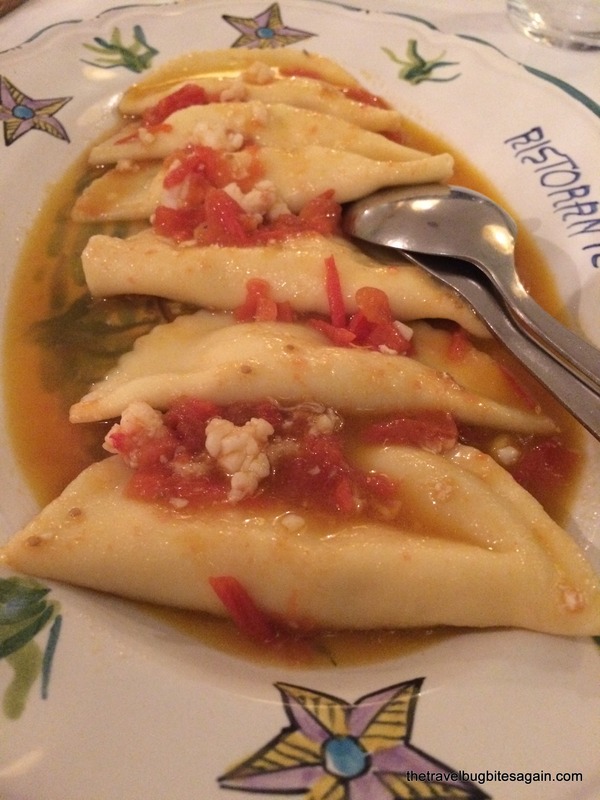 Most restaurants arrange a pick and drop from Nocelle, but we loved Croce so much that we kept going back. 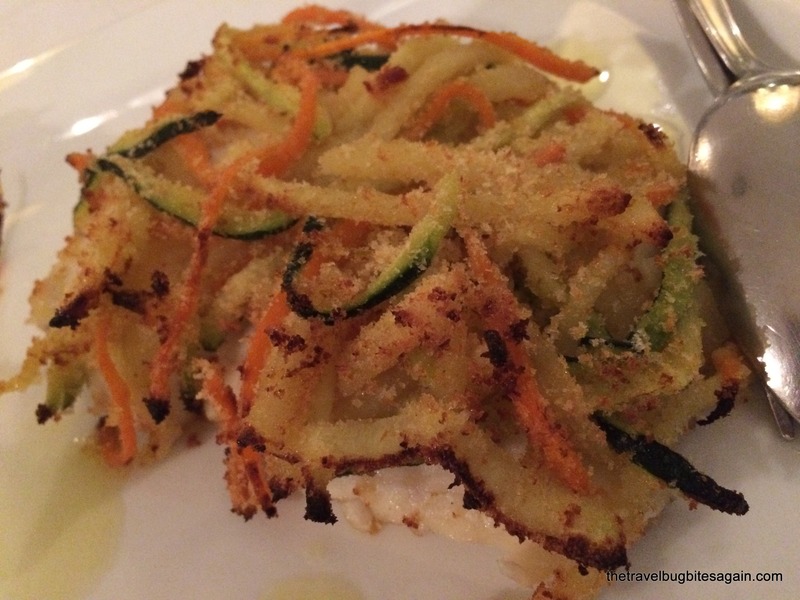 The food is exceptional and the service is great. 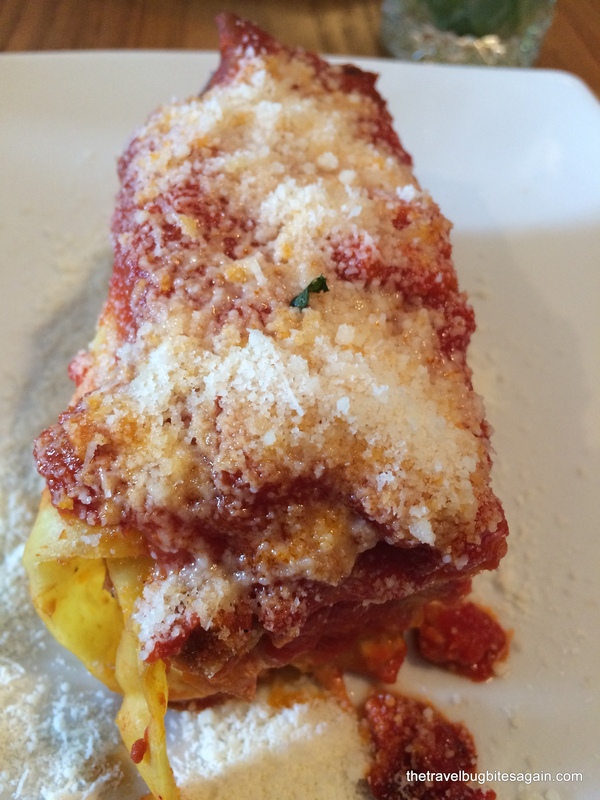 This lasagna was something else! We explored the village, with its narrow alleys and main square which is tiny. There is a small Limoncello shop at the square which was closed when we reached but we met the friendly owner in the street and promised to come back, we couldn’t though. The sunset in Nocelle is beautiful, you can see the rugged landscape of the coast amongst hues of orange and grey! Walking around is a great workout as its all steps, barely any flat surface. Probably the most relaxing evening of our trip was this one. Great views and conversation. 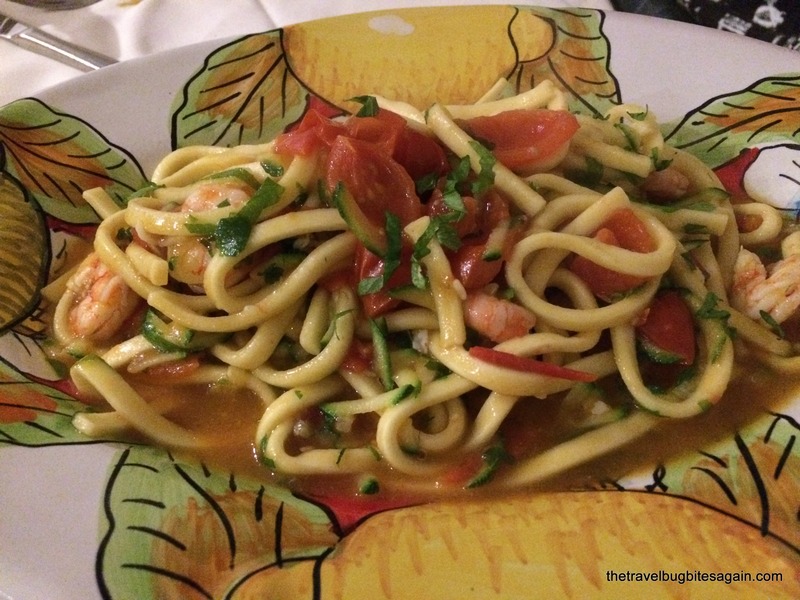 For dinner we were back at Croce, below is what we had. 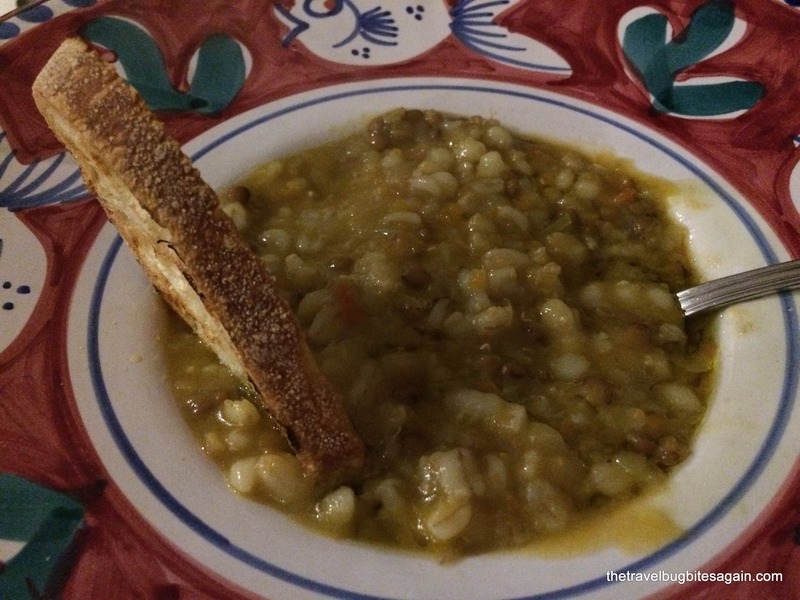 A farmer’s soup – very comforting indeed! 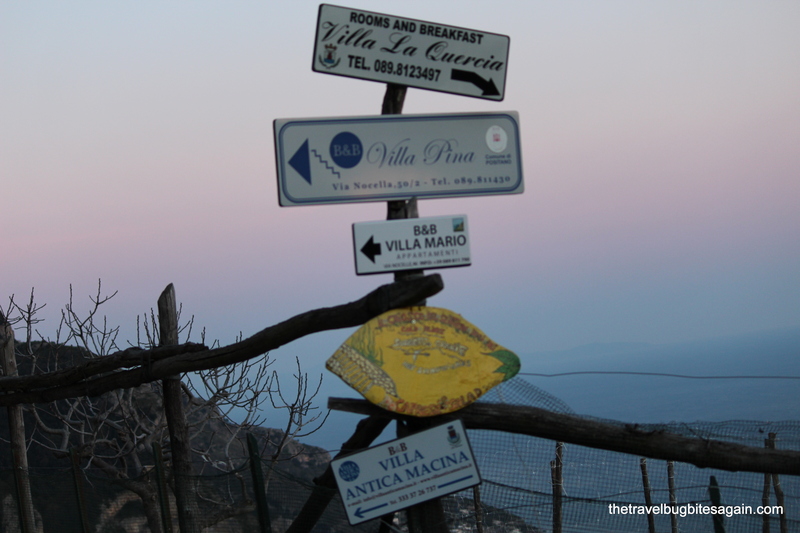 Coming up – Path of Gods trek, Positano and Naples. 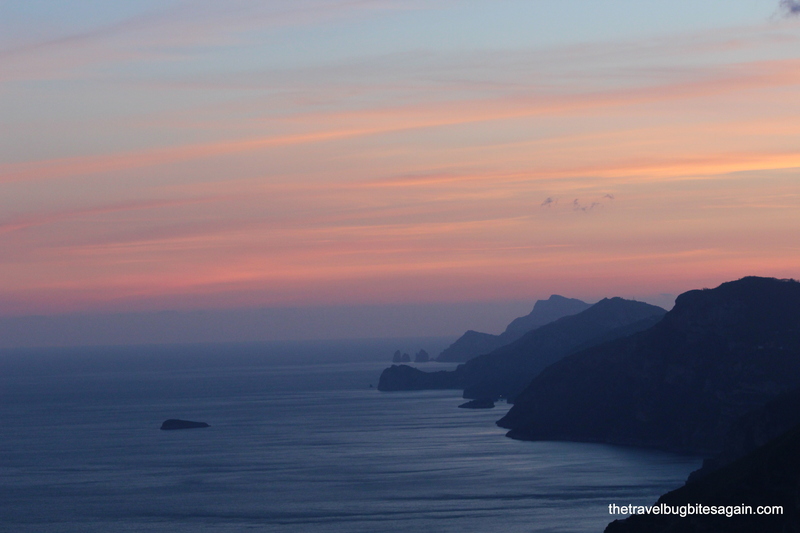 Have you been to Amalfi coast and what were your experiences of the same?